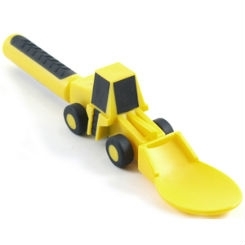 Constructive Eating presents its Front Loader Spoon! Designed with both fun and function in mind the pusher is great for getting soup into the spoon bowl! Kids will have fun and function in mind at the dinner table. Textured, easy grip handles and detailing allow little hands to hold on tight! Even the youngest child will animate these construction machines with their true-to-life- color, scale and shaping. No paints are used to color the product. The utensils are manufactured using only FDA approved materials. Our products contain NO Lead, NO Bisplenol A (BPA), NO PVC, and NO Phthalates. Our products are fully compliant with the CPSIA of 2008. Dishwasher safe and made in the USA!